Curate a designer style decor with this writing desk. 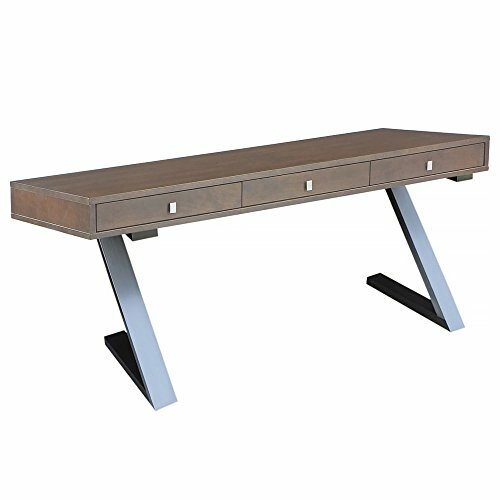 The stylish design features stainless steel legs with a wood top in brown or white and three spacious drawers.Details:Includes 1 deskWood, stainless steelWhite lacquer finish3 drawers101.4 pounds30 inches high x 59 inches wide x 24 inches deep Assembly required.Please note:Orders of 151 pounds or more will be shipped via Freight carrier and our Oversized Item Delivery/Return policy will apply.Please for more information. If you have any questions about this product by Aurelle Home, contact us by completing and submitting the form below. If you are looking for a specif part number, please include it with your message.